Abounded in rich natural resources, Tibet attracts a great number of tourists from home and abroad. Every year, numerous travelers head to Tibet to explore the majestic views and grand temples. 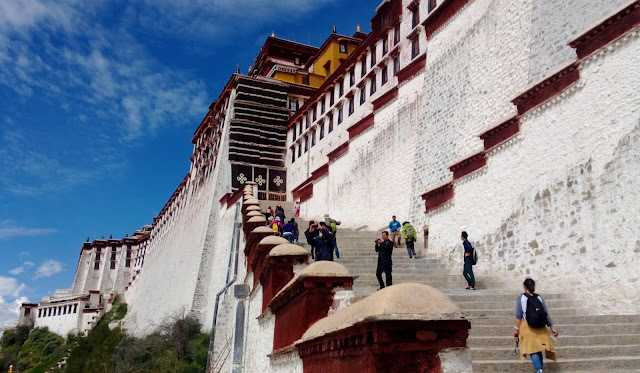 While how to choose the best place to go among the numerous attractions in Tibet has become the primary question for travelers. Here, I'd like to share the top of Tibet which is worthy of being recommended to you. Located in Tingri County, Tibet, Rongbuk Monastery was built in 1899 by a Tibetan Buddhist believer. With the high altitude of 5154 meters, Rongbuk Monastery is crowned as the highest monastery in China, even in the world. Situated at the foot of a high mountain, Rongbuk Monastery includes two parts, including the new part and the old part. There are five floors in the old part, but only two floors go into service. The new part of Rongbuk Monastery was built in 1902, and the area is larger than the old one with 8 subordinate small monasteries. At present, Rongbuk Monastery is the best site to enjoy the grandeur of Mt Everest, and the ideal place for taking photos. China National Highway 219 connects Tibet with Xinjiang together. The whole distance of the China National Highway 219 is about 2841 meters. Crossing over the famous Kunlun mountain, Karakoram mountain, Kailash mountain, and Himalaya mountain, Rongbuk Monastery has an average altitude above 4500 meters. The total length of the road above 4000 meters has 915 kilometers, and the total length of the road above 5000 meters has 130 kilometers. It is known as the highest and the most difficult highway in the world because of the low temperature, low oxygen content, fragile environment, complex terrain, and frozen soil. Like a silver dragon, Yarlung Zangbo River originates from the north of the middle Himalaya mountain with the high altitude of 5300 meters. Flowing through the south of the Tibetan plateau, Yarlung Zangbo River flows into the Bay of Bengal. With the whole distance of 3848 kilometers, Yarlung Zangbo River is regarded as the “Mother River” by Tibetans. The upstream of the Yarlung Zangbo River is the highest river in the world, and it is the abruptest in China. Located in the center of Tibetan Plateau, Lhasa city is the highest city in China with a high altitude of 3658 meters. It is also one of the highest city in the world. The terrain of Lhasa city in the north is high, while the south is low. The distance from the south to the north is about 202 kilometers. And the distance from the east to the west is about 277 kilometers. With the area of 31662 square kilometers, Lhasa city is the center of Tibetan politics, economy, culture, and religion. Lhasa is the first tourist destination for travelers who plan a tour in Tibet.